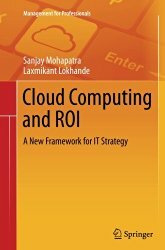 This book develops an IT strategy for cloud computing that helps businesses evaluate their readiness for cloud services and calculate the ROI. The framework provided helps reduce risks involved in transitioning from traditional “on site” IT strategy to virtual “cloud computing.” Since the advent of cloud computing, many organizations have made substantial gains implementing this innovation. Cloud computing allows companies to focus more on their core competencies, as IT enablement is taken care of through cloud services. Cloud Computing and ROI includes case studies covering retail, automobile and food processing industries. Each of these case studies have successfully implemented the cloud computing framework and their strategies are explained. As cloud computing may not be ideal for all businesses, criteria are also offered to help determine if this strategy should be adopted.